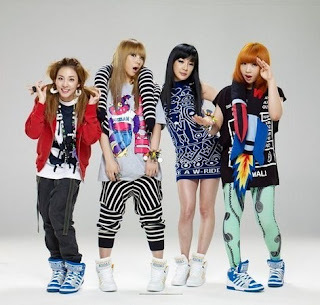 2NE1(Two anyone or 21 either way people know what you're talking about...sometimes) is a 4 member Korean hip hop / pop (not really so much pop in my opinion) from Seoul South Korea formed by YG entertainment in the year 2009. The band line up is CL, Minzy, Dara, and Bom. Now the band name is supposibly combining the phrase "21st Century" and "New evolution" 2 Ne(New Evolution) 1 and is said to be pronounced "To Anyone or "21". Hence my statement in the beginning. One thing a lot of people fail to realize is that these girls/artist are trained years/months in advance before actually releasing their debut song. 2NE1's first appearence was with the band Big Bang in their song Lolipop. I have to say I'm not that much into the song Lolipop because it just didn't seem to really flow with me, how ever, when I began to listen to their own music I have to say I Was highly impressed and I'm not the only one to disagree because they've one the "Song of the year" award from Mnet Asian Music Awards for their song "I Don't care"
Now I prefer to call these girls a hip hop group just for the fact the sound of their music. I mean I expect to be like booming the bass in my car listening to them. Granted though I love SNSD, I have to say I really like 2NE1's style. As I stated before each girl has their own style but some how flow together when it comes to the songs they sing. 1 downfall of 2NE1 and Korean pop is some of the fans (2NE1's fanbase is known as BlackJacks). Now I have nothing against any of you but sometimes some of you can be very tempermental and territorial. Fanwars seem to be popular among Kpop groups which is why I'm driven away from really listening to much Korean Pop. Fans don't understand how big a part they are to the bands "fame" and "success". Driving fans away and treated new comers in a rude way won't help them at all. Also bashing a band isn't going to make their popularity go down, in fact it makes it go up. If you bash a band then someone is going to come along and say "Well I'll look them up to see what you're talking about" then will google/youtube the band, listen to a song, and possibly say "This band isn't bad? What the frick man?!" Now this isn't all fans that act like this but "Fanleaders" As they are known in the music world have surface and somewhat discourage me. One good thing out of this? 2NE1's possible American Debut. while Girls' Generation(SNSD) has already debuted in America on letterman and Live with Kelly. It's been confirmed that the girls are working with Will.I.Am of the Black eye peas for an American album. I'm quite excited but hoping that they do not make their album all in English or at least make it half and half. I didn't listen to them because they were another "beiber" "Hannah Montanna" band. No offense. I liked these girls because they are unique and the style is rarely seen in America. Though how will America react to 2NE1? Well we'll have to wait and see. I give this band a 5 out of 5 because the band is powerful, visual, and has good things to say. I hope to see these guys live some day. I'm hoping for their american release to be a success and maybe this band will branch out to Indianapolis someday. Who knows. Do I see a high potential for Kpop? Yes I do. A lot of people I talk to seem to love it and there has even been flash mobs dancing to the music. What about other Asian music? Japanese rock as taken a toll on the over seas world. Listed below are my favorite 2NE1 song.